A photodiode is an electronic which, when exposed to light, generates a change in its electrical resistance. When incorporated into an electronics circuit, it can generate a signal when exposed to the right amount of light. 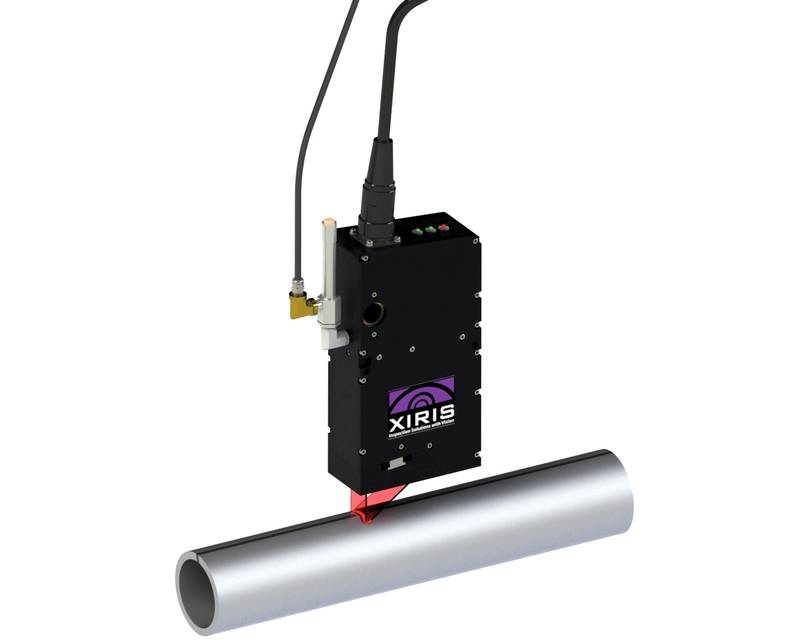 The Xiris Weld Cameras are equipped with photodiodes to detect the presence of a weld arc. Using Xiris WeldStudio software, the photodiode circuit can be used to toggle the operating mode of a weld camera from “NO WELD” mode to “WELD” mode or vice versa, based on the amount of light present in the weld environment. As a result, two sets of parameters can be defined, each associated with one of the two camera modes. Of the many parameters that can be defined, there is the shutter mode, which can be set typically for Rolling shutter in the NO WELD mode and Global shutter in the WELD mode. Toggling between the two modes can happen automatically by enabling the Auto Weld Mode option in the WeldStudio software. The photodiode sensitivity threshold can be adjusted from within the WeldStudio software to ensure that the NO WELD/WELD triggers on the right amount of light coming from the weld process. When light is emitted from the welding process, the photodiode will activate, toggling the software from NO WELD to WELD mode. When the welding process ceases, the lack of light will have the opposite effect. Better Images. Better Decisions. Better Process Control. Follow Xiris on social media for regular updates and welding videos! In today's modern manufacturing environment, continuous improvement is needed to stay competitive. This means equipment up-time, speed and product quality must always be optimized to increase yield and profitability. Any downtime can be minimized by keeping all production and online inspection equipment well maintained and calibrated. The Xiris WI sensor head Recertification Program is designed to recertify WI sensors onsite at your facility by Xiris personnel with minimal interruption. This helps ensure optimal WI system performance by maximizing tube mill productivity and should be a part of your ongoing quality assurance and yearly preventive maintenance program. Xiris Recertification Program is done by factory trained personnel and has been designed to ensure your investment in the WI2000/3000 pipe and tube inspection equipment is functioning optimally and in accordance with factory performance plans. Recertification takes less than 1 day onsite and we use our field certification kit to check all electronic and optical components to verify laser power is at recommended levels, camera optics are aligned and focused and within factory specifications, and that head measurement accuracy meets factory specifications. We will also update sensor head firmware, if required, and apply a sticker with date of certification. We perform a generalized computer health check, install any software upgrades as applicable and backup system software and settings. As a final step, Xiris will also provide you with a detailed report outlining the sensor certification and status, condition of the system and any recommendations to address potential system risks. NOTE: No internal adjustment can be done in the field due to laser safety requirements. Any internal repairs would have to be done at a Xiris facility under a separate quotation. A WI2000 or WI3000 system is a major investment that can continue to provide a significant productivity gain for your tube mill as long as it is properly maintained and recertified on a yearly basis. High Voltage Cable is a multi-layer cable used for running high voltages underground or underwater. The integrity of the cable is very important – the insulation of the cable must not deteriorate due to the high voltage power being transmitted. 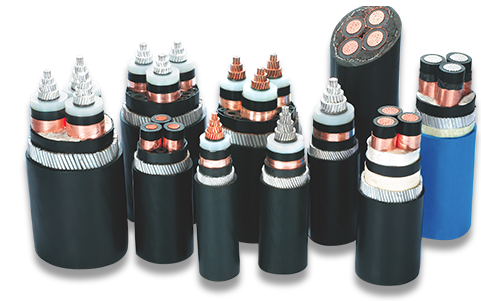 Often a high-voltage cable will have a metallic shield layered over the insulation, connected to the ground and designed to equalize the dielectric stress on the insulation layer. This metallic shield is effectively a welded tube, wrapped around the conducting cores and insulating layers of the cable and welded together as the cable is made. If the fabrication process of forming and welding the metal sheath tube is not done properly, the cable may fail its final quality specification and may require to be destroyed, a very costly prospect for the manufacturer. 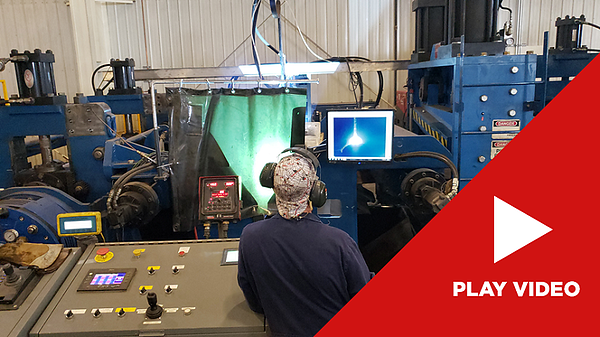 Using a weld inspection system such as the WI2000 system from Xiris, measurements can be made on the production line of the final welded sheath of various attributes such as Mismatch, weld Bead Height and Freezeline to help determine if the metal sheath tube is being welded correctly. If any of those measurements begin to drift out of tolerance, an operator can be alerted to make adjustments in the input parameters to bring the process back in control avoiding any scrap production. The result is a better quality welded sheath tube on the cable that has a better chance of meeting the final end user’s specifications. MIG processes, particularly short circuit MIG, will generate a huge range in brightness during their metal transfer cycle: when the arc is extinguished as the wire makes contact with the parent material prior to expulsion, the image can be quite dark. However, after an explusion occurs and the arc is re-established, the image may be very bright as the arc intensifies to its maximum. 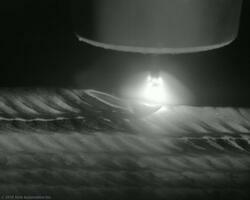 Using a camera to acquire images of a MIG weld process in free running mode can be problematic when the amount of light present in the image varies considerably. The variation in light is based on when during the metal transfer process the image exposure takes place: when the arc is extinguished, the image will be dark; when there is a full arc, there will be a bright image. However, if the camera acquisition is triggered by an electrical pulse generated by the camera power supply, the result will be a consistent image of the weld process that is repeatable because it is at the same point of the weld cycle. Wire is fed continuously and makes contact with the workpiece to complete the electrical circuit. At the point of contact, a short circuit occurs, resulting in a huge spike of current moving through the wire between the torch and the workpiece. At point of wire contacting the workpiece, arc gets extinguished. Segment of wire rapidly vaporizes under high current and an arc gets re-established. Current falls as there is no short circuit. While capturing the welding process to see certain features, it is sometimes interesting to only take images at a certain point in the metal transfer cycle. Rather than using a weld camera in free running mode where image acquisition is based on the clock cycles inside the camera, an efficient alternative is to use an external trigger that is based on the current levels present in the welding power supply. If a circuit can be designed to generate a trigger signal based on the rising edge of the current level, then the trigger could be used to initiate image acquisition, resulting in video with an increased consistentency in brightness and quality because each frame will be acquired at precisely the same point in the metal transfer process. Further enhancement to the performance of the imaging process is possible by tweaking exactly when the images are acquired through adding a delay. A delay can be added after the trigger signal is generated so that the exact imaging characteristic can be seen. 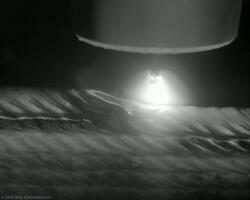 For example, imagine wanting to see only images of the metal transfer process after the weld arc is extinguished. 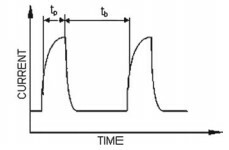 To do this, a trigger signal should be generated based on the current pulses coming from the weld power supply. It may not be possible to receive the trigger at the ideal point in the metal transfer process, so a programmable delay can be added to make sure that the image acquisition occurs at exactly the right point. The above two successive images show a MiG process at roughly the same point of the metal transfer process over different cycles of the metal transfer. In this case, the imaging was tuned to see exactly what the viewer wanted to see: the melt pool fully visible with the welding arc present. Imaging a MIG welding process can be fairly difficult if using a weld camera in free running mode. However, if a circuit can be designed to clamp on the rising edge of the current pulse, it can provide an excellent trigger to use to acquire consistent images at similar points in the metal transfer cycle. The result is much more uniform images with similar brightness levels, allowing for better analysis and increased efficiency of the welding process. Who doesn’t love an inspiring transformation story? Weld inspection systems truly are capable of transforming your quality assurance processes and one of our Spanish customers has quite the story to prove it. Tubos de Legutiano Automoción (TLA) is a manufacturer of high-quality tubular products for the automotive market. By producing thin-walled exhaust pipes, TLA helps their customers reduce the weight of their parts, while maintaining high quality standards that are able to withstand the strict demands of the automotive industry. TLA recently said that their most important customer, a large automotive parts supplier based in France, was both surprised and delighted to notice a sudden, significant improvement in TLA’s quality, so much so that they wanted to pay them a visit. 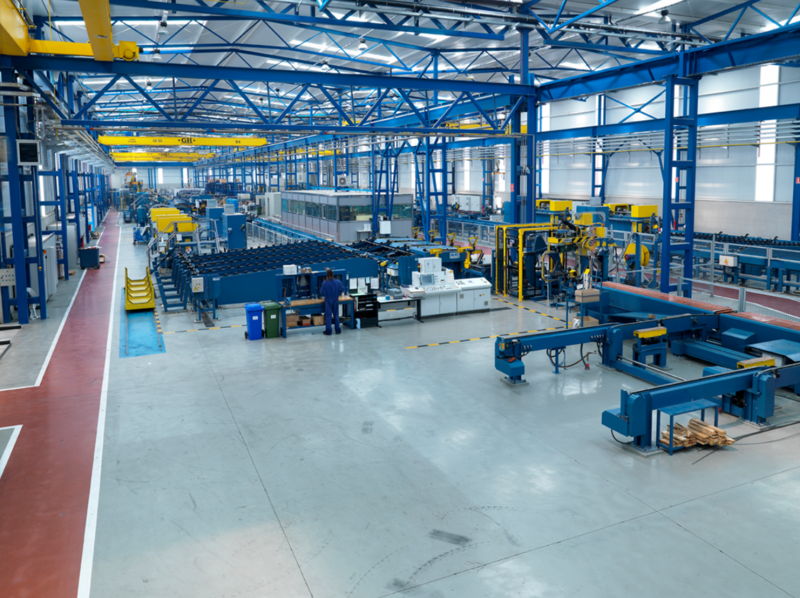 Once visiting TLA, the French automotive parts supplier realized that the improvement in quality was due to the introduction and implementation of the Xiris WI2000 Weld Inspection system used on their two tube lines. By detecting defects that were previously not detectable using any other NDT test process, TLA was able to address the imperfections that were plaguing their production for years. The result was that, once implemented, the WI2000 systems were able to catch defects and help perform better process monitoring to keep their tube product in control. Consequently, fewer defects made their way to the end of the production line and shipped to their customer in France. Xiris’ High Dynamic Range (HDR) welding cameras can be used in a multitude of ways, some of which our customers have discovered on their own. For example, a manufacturer of thick-walled steel pipe recently figured out how to use our cameras in a way that has greatly improved the efficiency of their coil joining process. Operators only have about 10 minutes to end-sheer, mate, and weld coils during the semi-automatic front-end part of the process. The cost of coil joint failure is high, so the manufacturer would stop the tube mill to check on the integrity of the coil joint before continuing. Even though the stoppage prevented more-costly failures, it had its own cost. What our customer needed was a way to adequately monitor the end joining in the infeed buffer of the pipe mill without having to stop the process to assure correct coil matching. 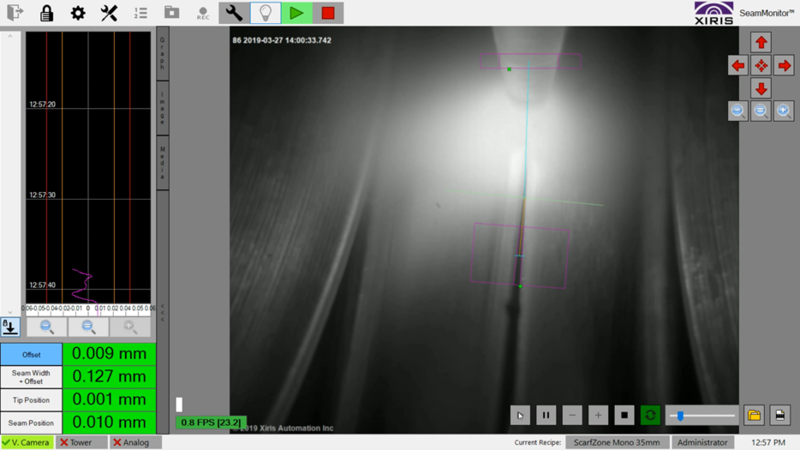 They knew the capabilities of our cameras to enable real-time remote monitoring of weld processes with greater visibility than ever before possible. So they developed a plan to use Xiris XVC-110e50 cameras to monitor the coil joining during the front end of the process. This monitoring eliminates the need for routine stoppages. This solution also keeps operators safer. Coil joining is performed using a MIG welding torch mounted onto a linear track with dual-axis torch position. Previously, operators had to be close enough to the torch to see what was happening with the weld. With the Xiris HDR cameras, they have a clear view of the coil joining process from a safe remote location. With their creative use of our HDR camera technology, this manufacturer was able to significantly reduce the time and cost of coil joining, while increasing consistency. For a video of the coil joining process taken by the XVC-1100e50 camera, please view the video below.